For over 50 years, children have been playing with Play-Doh toys. This soft pliable dough has been packaged in the same bright yellow containers for decades. The smell, the feel and the fun of PlayDoh is something that children remember forever. As adults, they can not wait to share Play-doh with their own children and grandchildren. Not all toys start out as toys. 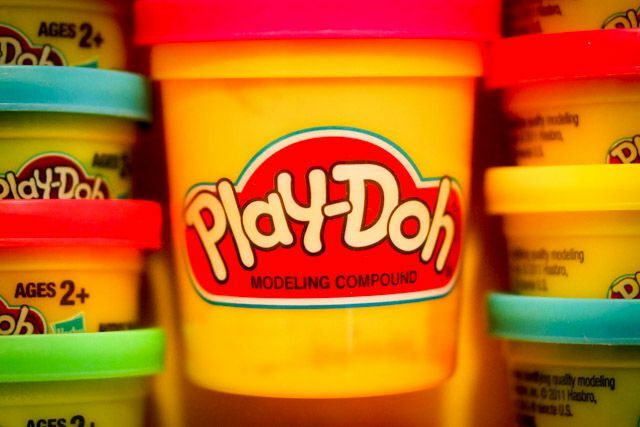 The compound for Play-Doh was first created in the 1930's by a soap company, Kutol, in Saint Louis. The company was actually trying to invent an effective wallpaper cleaner! Given Play-Doh's mess free texture and putty-like handling, when it was not successful as a wallpaper cleaner, so iit was relaunched as a toy. Play-Doh is a modeling compound for kids. Play-Doh can be bought in primary colors, like blue, red and yellow. It is also popular in neon colors, too. Play-doh arrives in yellow, sealed cans. These are the same recognizable cans that people have been able to identify with for decades. The Play-Doh texture is pliable. Children and adults like to squeeze, pinch, knead, and pull it into different shapes in order to make pictures and designs. Some use their imagination to create their own invention. Others like recreating items that they personally enjoy like animals, cars, balls, snowmen, and play food. What Types of Play-Doh Toys are Available? Play-Doh is owned by the well-known toy company, Hasbro. Hasbro designs many toys, especially for Play-Doh. There are many play sets for kids to use along with their Play-Doh that include molds and tools. Many of these sets include popular Disney Princesses and My Little Pony characters. Kids can even use their Play-Doh to "play dentist," and serve up breakfast foods or sweet treats like pretend cupcakes and ice cream cones. There are many Play-Doh play sets available to buy on Amazon.com. What Do Kids Learn From Play-Doh? Play-Doh is also known as go-to educational toy for young children. Play-doh is used in many preschools to help teach children how to recognize and form letters and numbers. Children can use the Play-doh tools to strengthen their hands, which is needed for later holding a pencil to write. With supervision, at home and at preschool, many children like to use their Play-Doh with kitchen utensils like plastic cookie cutters, rolling pins and garlic presses. When using Play-Doh at school, many children practice rolling and rearranging Play-doh into letters and numbers. Children can also use their Play-Doh to learn about colors because Play-Doh can be mixed and swirled. Play-Doh is a fun sensory activity. Many children are able to reduce their anxiety and calm down when overwhelmed by taking some time to sit and play with Play-Doh. What is the Play Doh Recipe? The original Play-Doh recipe is a closely guarded secret that is not public knowledge. It is believed to be a combination of wheat flour, salt, a hardening agent, borax, and mineral oil. Can I Make My Own Play-Doh? Many people choose to make their own Play-Doh. There are many different homemade Playdough recipes to choose from. It will not be the exact same as the original Play-Doh, but it is cheap to make in large quantities and kids often do not know the difference. Will Play-Doh Make My Child Sick? Play-doh is nontoxic. It is safe to play with but not recommended to eat. If Play-doh is not placed back into a sealed bag or container, it will harden and dry out. Play-Doh includes wheat. Many people who are on gluten-free diets prefer to make their own Play-Doh to eliminate this ingredient. Are There Other Play-Doh Toys? When children get older, there are other Play-Doh toys children can enjoy. Play-Doh plus is a softer Play-Doh compound that is included in many sets that is used especially for decorating. Doh Vinci is another Play-Doh compound that arrives in tubes and is placed in a styler tool, similar to a glue gun, that is also used to decorate. Article edited by Keriann Wilmot, Toys Expert. Is your child interested in the galaxy? Make this amazing galaxy jar!